Java 7 brings many new language features and new classes to the Java developer. One of the new classes included in Java 7's new concurrency offerings is ThreadLocalRandom (located in the java.util.concurrent package). ThreadLocalRandom extends java.util.Random, but intentionally does not support the explicit setting of seed its parent class supports. ThreadLocalRandom prohibits explicit setting of its seed by overriding Random's setSeed(long) method and automatically (always) throwing an UnsupportedOperationException if called. Although ThreadLocalRandom encourages more true randomness by prohibiting explicit seeds, this can be achieved in Random by simply avoiding explicit setting of seeds. The real advantage that ThreadLocalRandom brings is performance in concurrent applications. The ThreadLocalRandom class is easy to use and one approach is shown in the next code listing. The code listing provides enough methods to compare Random to ThreadLocalRandom using an explicit seed in each case and relying on implicit seeding in each case. * Simple demonstration of Random and ThreadLocalRandom. * Provide a random integer. * Provide a random integer using provided seed. * @param newSeed Seed to be used in acquiring random integer. * instance results in an UnsupportedOperationException. * @param newSeed Seed to attempt to use with ThreadLocalRandom. * @throws UnsupportedOperationException This exception is always thrown! out.println(  "Seeded Thread Local Random Integer: "
The next screen snapshot shows the output of running the above code twice. The output demonstrates that using the same seed leads to the same "random" integer when using Random. 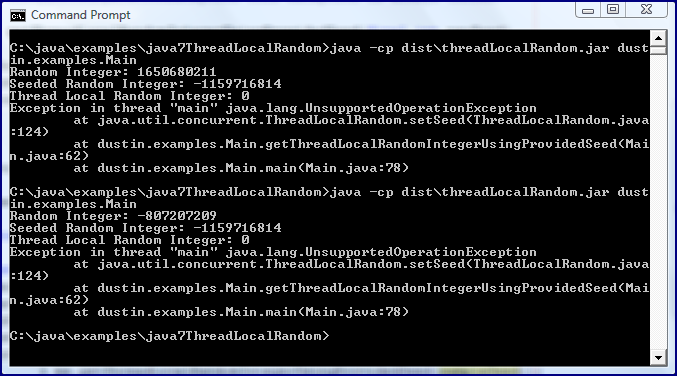 It also demonstrates that ThreadLocalRandom does not allow the explicit setting of a seed. Unlike Random, the ThreadLocalRandom class does not provide a constructor taking the seed (in fact, it provides no constructor at all). With no constructor accepting a seed, the setSeed(long) method declared by parent Random class was the remaining approach for setting a seed explicitly. ThreadLocalRandom shuts this option down via the overridden implementation that throws the UnsupportedOperationException. 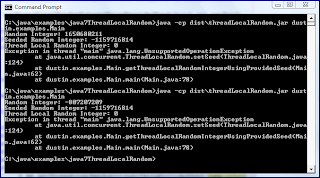 ThreadLocalRandom is a simple addition to the Java SDK, but is an improvement that can occasionally be welcome when using random numbers in highly concurrent applications.